PAROC Hvac Bend AluCoat T is a non-combustible stone wool pipe section bend for thermal and condensation insulation of pipework in buildings and ships. 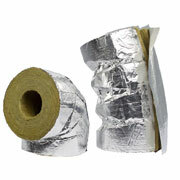 It has a reinforced aluminium foil facing and tape in the longitudinal seam which prevents condensation. Factory produced bends are a very good and fast insulation solution for pipe elbows. Surface temperature of the facing must not exceed +80°C (temperature restriction determined in accordance with heat resistance of adhesive).